Yes to music, no to sweat. Secure and comfortable fit Extensively tested in real workouts, these headphones have a secure fit that you can adjust to y. (2) Turn on bluetooth on the device you want to pair, the device will automatically detect the earphone which is in "Pairing mode". THE HEADPHONE NEEDS TO BE PAIRING FIRST BEFORE IT CAN BE CONNECTED. Bluetooth instructions. 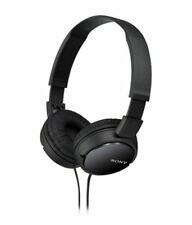 Sony MDR-V6 Studio Monitor Stereo Headphones - Black. Simply connect the transmitter dock to your TV with the supplied cable, and sit back as the headphones sync to the dock. - Enjoy clearer dialogue for shows and movies with a touch of the Voice Mode button. Noise Cancelling reduces up to 95% ambient noise. 80 hours battery life (Noise Cancelling on). Headphone Power IndicatorLED (green). Passive OperationYes Noise Cancelling. ACQUIRED DIRECTLY FROM A SONY LIQUIDATOR PHOTOS ARE OF THE ACTUAL ITEM. FREQUENCY RESPONSE (BLUETOOTH® COMMUNICATION). Fine-tune your sound using the Sony | headphones connect app. Fine-tune your sound using the Sony | Headphones Connect app. Micro USB, Stereo Mini Jack. CORD LENGTH. 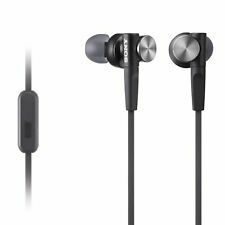 Sony MDRXB950BT/B Extra Bass Bluetooth Headphones (Black). Bluetooth audio streaming with AAC and apt-X support, Electronic Bass Boost circuitry for added bass emphasis, Passive mode for normal, corded operation without battery. Type Headphones. Connectivity Bluetooth Wireless. Product Key Features. Connector(s) Straight Stereo Mini-Plug. Color Black. Manufacturer Color Black. Sony MDRXB950BT/L Extra Bass Bluetooth Headphones (Blue). Bluetooth audio streaming with AAC and apt-X support, Electronic Bass Boost circuitry for added bass emphasis, Passive mode for normal, corded operation without battery. 0.35 in neodymium drivers for dynamic sound. 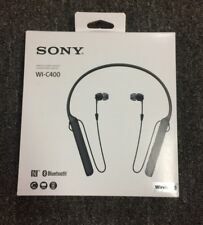 Sony WIC400B Around-Neck Wireless In-Ear Headphones (Black) -WIC400/B. Easy Bluetooth connectivity with NFC One-touch. Up to 20 hours of battery life. 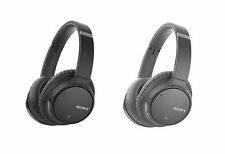 Sony MDR-XB650BT Extra Bass Bluetooth Headphones - Stereo - Black - Wireless - Bluetooth -24 Ohm - 20Hz - 20KHz - Over - the - head - Binaural. Type Headphones. Connectivity Bluetooth Wireless. Product Key Features. Connector(s) Straight Stereo Mini-Plug. Color Black. Manufacturer Color Black. Fit Design Headband. 5 out of 5 stars - Sony MDR-XB950B1 Extra Bass Wireless Headphones with App Control Black. 109 product ratings109 product ratings - Sony MDR-XB950B1 Extra Bass Wireless Headphones with App Control Black. Trending at $62.77eBay determines this price through a machine learned model of the product's sale prices within the last 90 days. These are in very good condition everything has been tested inspected and cleaned, case may have a little wear. Trending at $46.39eBay determines this price through a machine learned model of the product's sale prices within the last 90 days. Yes to music, no to sweat. Secure and comfortable fit Extensively tested in real workouts, these headphones have a secure fit that you can adjust to y. Manual not included but may be found here From the manufacturer.